Preparing For Your Successful Show! 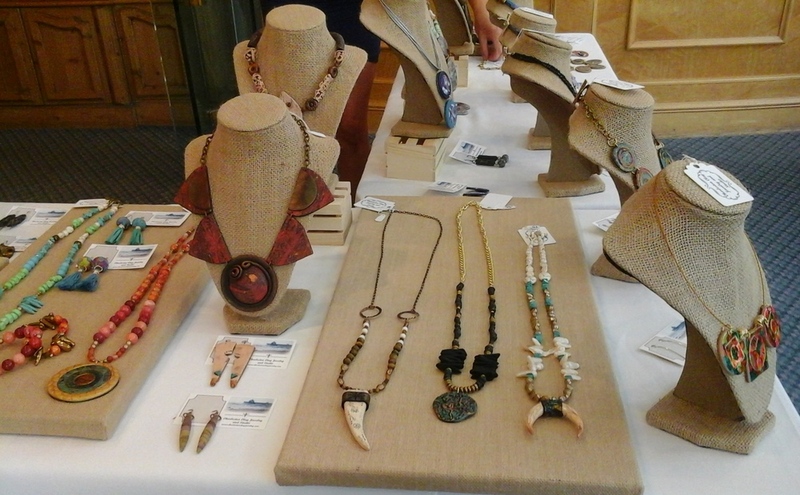 — Charleston Clay Jewelry and StudioCCJ Blog Preparing For Your Successful Show! Preparing For Your Successful Show! Getting ready for a show can be very stressful! I want to share with you my process for simplicity and stress-free preparations! Another successful show for Charleston Fashion Week 2015! The first thing to think about when preparing are the little details. Your theme and colors should be consistent with your logo and branding designs. For instance: My logo is a picture of Folly Beach with slight blues and grays and hints of sand. My display should be neutral and sand like because my overall feel is beachy and rustic, and I want the jewelry to be the primary focus. Your table should be clean and simple, cluttered merchandise will make you appear unprofessional and unprepared. You don't have to display all items at once if you are short on space. The key is proper visual stimulation. Use risers to display pieces in the back and come up with a way of separating the items, for instance I used canvases laid flat to display my long necklaces and matching bracelets! You should be neat and professional. Of course your wardrobe should be one to accent your work or the type of show you are taking part in. My show was during a high fashion event so I needed to be fashionably dressed to suit the styles I would be around. Just be sure that you are comfortable in what you are wearing. You don't want to wear brand new shoes or clothes because you are risking fidgeting or painful feet! Tags and display cards must be suited to your overall theme as well. They should clearly display your logos and website. However, the tag should never be too bright or patterned, this will only take the focus away from your art! Many artists cannot afford to have these tags and display cards outsourced to big companies, but you can always do these yourself with the right tools! Check out www.avery.com for templates on tags, business cards, and labels! The one thing I recommend outsourcing is your packaging. Especially if you are a full time artist and sell and ship a lot of merchandise. All my packaging is branded with my basic logo and the company uses 100% recycled materials to create these beautiful brown kraft boxes, in keeping with my neutral and blue themes. These must be sturdy and high quality! Trust me, the upfront expense is very worth the outcome! I use Carolina Retail Packaging and I find the cost and product incredible! I use my simple logo and my company statement on all my packaging. An example of my long necklaces on the canvases. Too many times I have attended shows or events and noticed other vendors behaving in off putting ways. Ignoring customers, avoiding discussion. not thanking the customer, or even being downright rude! As a southern lady my mama always taught me that a warm smile can melt the ice off any cold heart! A warm smile goes a long way to increase your chances of sales! Take some time before your show to rehearse your story and artists statement. Be prepared for customers to ask about what you do! Showing an interest in your art is a huge compliment. Always ask how the customer is doing. "Are you enjoying the event?" "How are you today?" and always offer a genuine smile and the let the customer do some talking. Avoid the overly aggressive or desperate tactics. No one wants to buy from someone who seems they can't get rid of it fast enough! Be inviting and entice them with a quick explanation of what you do. Then offer to help them try on a piece to see how it looks, the soft sell is always the welcome approach. It's understandable to be nervous when selling your art. You are putting your heart and soul out their for critique and criticism. Don't avoid your customer or sit behind your tables like a bump on a log. Stand up, greet them, and be social. If you appear uninterested in your own work and selling it, how can you expect your future customer to be any different?? Of course- never be rude! After doing as many shows as I have you will always come across those individuals who are negative or just mean. Keep your composure and your professionalism. Bad news gets around fast and you want to be invited to shows again and maintain a good reputation with other vendors who will recommend you for other events. I hope that you have tremendous success with your art and creative passion! Feel free to ask me any questions on marketing yourself or your art! Blessings to all! Newer PostFinding Your Voice as an Artist! Older PostSummer 2015- Fashion breakdown and new summer jewelry sneak peek!